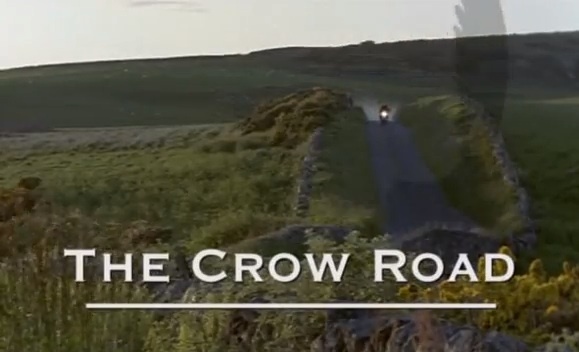 A must see for any Iain Banks enthusiast, The Crow Road miniseries frames perfectly the late writer’s sixth novel. Released by the BBC in 1996, directed by Gavin Millar and starring Scots actors Joseph McFadden, Bill Paterson and Peter Capaldi, the four-part series presents a coming of age story, following the life of the protagonist Prentice McHoan. Growing up in the fictional town of Gallanach, Argyll and living and studying in Glasgow, McHoan’s array of turbulent post-adolescent experiences contribute to form a narrative of the throes of growing up, coupled with an apt, enlightening learning curve supported by the backdrop of a detective like sub story. Episode one begins in Gallanach as Prentice and his family attends his grandmother’s funeral. Prentice initially narrates: ‘It was the day my grandmother exploded. I sat in the crematorium, listening to my Uncle Hamish quietly snoring in harmony to Bach’s Mass in B Minor, and I reflected that it always seemed to be death that drew me back to Gallanach’. Following the funeral, the sporadic, non-linear narrative switches to Prentice sifting through his uncle Rory’s (Capaldi) writings. Having mysteriously disappeared whilst riding his motorbike from his girlfriend’s flat in Glasgow to Lochgair, the story reveals his elusive, nomadic uncle had been working on a novel titled The Crow Road. As the plot develops, Prentice’s intrigue and investigations into his missing uncle and his works is juxtaposed by the unfurling of further family issues. His cagey relationship with his father Kenneth (Paterson), centered on the latter’s curt dismissal and indifference to religion, provides a relevant reflection of the disparate relations he shares with his family and the tempestuous emotions he faces throughout the story as he proactively seeks answers regarding his family. Faced with various other temptations and challenges, including unrequited love with his attraction to a girl his brother ends up marrying, his education suffering, and virtually ubiquitous death, the narrative’s composition holds up both a chaotic and light-hearted depiction of the life of a young student alongside a quintessential British murder mystery story arc. One of the central aspects of the series, diverging from the novel, is the multiple character storylines and the use of flashbacks – with each episode titled under the name of one of the story’s characters. This technique offers a wide scope into the lives of other characters that are directly effected by and are involved in the story’s central question surrounding Rory’s disappearance. The quaint rural setting of Gallanach establishes a double-edged sense of innocent homeliness and claustrophobic small town tension. The community of Gallanach as a whole, alongside the McHoan family, is placed in the narrative scope. Equal to this is Prentice’s student life living in the west end of Glasgow, coincidentally (not) on Crow Road. Coming from Argyll myself and living and studying in Glasgow, Banks’ The Crow Road is arguably the closest novel I can relate to individually. From the stunning bucolic location of Argyll in the opening credits, to the almost surreal scene of Prentice stepping off a train at Partick train station, both the book and its considerately executed TV adaptation I highly recommend to anyone reading the brilliant Banks for the first time or any Banks fan.